GD Separators l Vortox Air Technology, Inc.
GD Separators prevent contamination on brake lines by filtering and separating dirt, oil, and water out of an air stream. The GD design is application specific – locomotive air brake systems – but is open to customization. 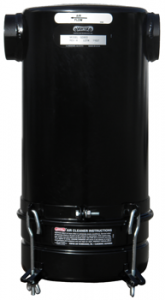 Each Separator is built with Electro Galvanized coated cold rolled Carbon Steel and finished in a black baked polyester coat. Customization in size and design is available upon request. Vortox Air Technology filter media, made of finely coiled interlocking Stainless Steel wire, lines every separator and collects the unwanted contaminate.